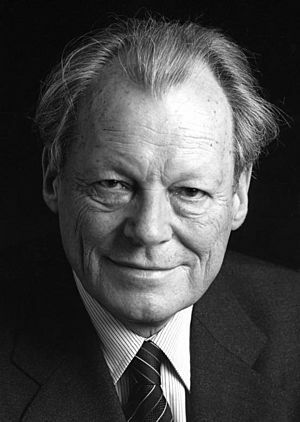 Willy Brandt (Herbert Ernst Karl Frahm; 18 December 1913 – 8 October 1992) was a German chancellor from 1969 until 1974. He was born Herbert Ernst Karl Frahm on 18 December 1913 in Lübeck Germany. He was the leader of the Social Democratic Party of Germany 1964–1987 and winner of the Nobel Peace Prize (1971). He died on 8 October 1992 in Unkel on the Rhine. Brandt stayed leader of the SPD, and later of the Socialist International too. He was member of the European Parliament from 1978 to 1983. He gave up the position as chief of the SPD in 1987. Willy Brandt Facts for Kids. Kiddle Encyclopedia.